The tradition of training elephants goes back some 4 000 years, developed in the Hindu valley, as far as the oldest paintings and statues document. All over southeast Asia the traditions of catching and training wild elephants spread. In most cases the elephants were possessed by rich kings, for war or prestige, and the trainers formed into particular castes, trained and disciplined by superior trainers in the kings elephants stables, forming the elephant cavalries. By this time the elephant handlers were entitled great honor and prestige. Originally, an art of hunting tribes, that used to capture elephants now and then, it became a profession, where knowledge were handed down from old generations to younger. In large stables the riders were soldiers, and organized like a cavalry. 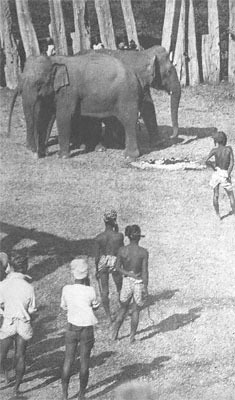 Elephants were caught with lassos from tame elephants (mela) trapped in pits, or scared into large pallisades (keddha). After capture, a selection were done, and the most promising animals were kept to be tamed. They would be roped, and pulled out from the Keddha, with help of specially trained elephants called Kungkhies. 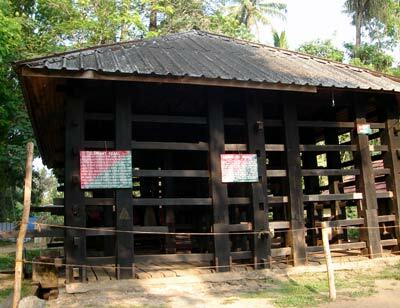 After a period in a Kraal, a cage with wooden bars, were the elephants could be approached in safety, and where the first contact was made with food, water and rewards, as well as punishment for agressivness, the elephants would undergo training with Kungkies and experienced mahouts. The training included being overpowered and pulled down in lying position with help of ropes, but there was less hitting than what people in general expect. The more an elephant gets hit during this period, the more dangerous is the work for the trainer, and the longer time it will take to reach a stage, where the trainer can approach the elephant, and stand beside it, without being attacked. The sooner the captured elephant starts to cooperate, the sooner the work gets safer for the mahouts, and the training progress develops. After some three or four months, the captured elephants would be taken to work with the other tame elephants. The tradition slowly spread towards the west. The first historically recorded elephant in northern Europe was the animal brought by emperor Claudius, during the Roman invasion of Britain in AD 43, to the British capital of Colchester. Among the earlier Zoological Gardens in Europe after the fall of the Roman empire, was the three menageries owned by emperor Charlemagne, (Karl the Great) Aix-la-Chapelle, Nijmegen and Ingelheim. In 797 he received the elephant Abul-Abbas as a gift from Harun-ar-Rashid. In 1255 Louis IX of France gave an elephant to Henry III of England, for his menagerie in the Tower of London. It was the first elephant to be seen in England since Claudius' war elephant, and is claimed to have died in 1257 from drinking too much wine. Hansken, a female elephant from Ceylon that became famous in early 17th century Europe, was touring through many countries demonstrating circus tricks, and sketched by Rembrandt and Stefano della Bella. Each book gives an insight in the different epochs that elephant management went through in Europe between 1200 and 1900. 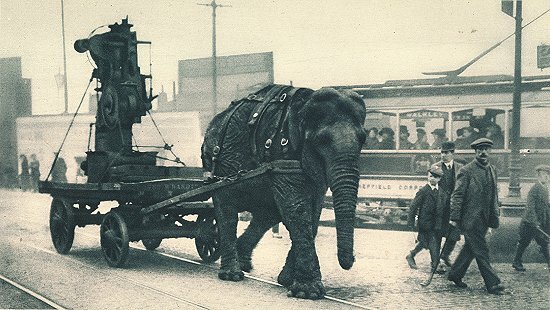 A military elephant in World War I pulls munitions in Sheffield. Illustrated War News, 9 February 1916, pt. 79, p. 3.
trainer Matthew Scott, London Zoo. But until the late 1800�s elephants were so few so training them was not yet a western profession. When Carl Hagenbeck in Hamburg, Germany, became involved in international trade in wild and trained animals, there was a demand for people to train them, and follow them to their new owners. Hagenbeck improved management and training of exotic animals, and worked for more humane training methods. The Europeans was trained by Asian mahouts, often from Sri Lanka, and a mixture between the Asian mahouts, and the German horse trainers mentality formed the western elephant trainer, while in America, a major part of elephant trainers had a stronger circus affiliation, and until the 1980�s, european elephant keepers used to think that people in U.S.A. exposed a higher degree of combined fear need of control, and harder methods. 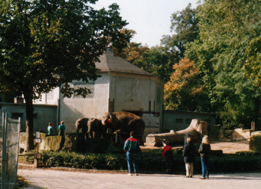 Germanys oldest elephant facility in Dresden Zoo 1999. Built in 1890�s, teared down 2000. Photo: Petra Schmidt. 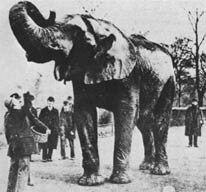 The 1900�s saw a fast development of imports of elephant for circuses and shows in Zoos. This was a rough time for elephants, and even if the training methods only seldom were as brutal as animal welfare people describe them, the elephants suffered from bad food, cold weather, lacking of "normal" mental stimuli and possibilities to perform natural behaviours, but already now they started to breed. in riding during summers in the fifties. Without bullhooks, hotshots, or whips. Keepers still had a lot of time in interaction with their elephants, since they were walking the whole day with them, why the bond between keeper and elephant was almost as strong as the mahouts and elephants in Asia. But the space for the elephants was very limited. On the other hand, the training was often succesful, and undisturbed by welfare people, and most elephants were allowed to walk around the zoos, and was put in work during riding operations for children, just like working horses. Although unnatural, this provided both mental and physical health, and stimuli for the elephants, who othervise was kept on small restricted areas, often on chains, if they were kept inside. 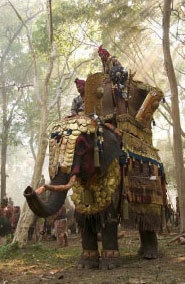 Most of those riding elephants were strong, wellmuscled, and calm in their mental behaviour towards people. In a few cases, some of them could become agressive, and since it was easy to import and buy new elephants, such specimens were not used anymore in interraction with humans, and some of them were killed on the spot. Dan Koehl riding Shoepfi in Dresden Zoo. Photo: Petra Schmidt 1999, Dresden Zoo. Accidents occured mainly with bulls in those years, very seldom with cows, and the elephants could be trusted on walks or ridings free in the zoo, with no special safety fences or such. 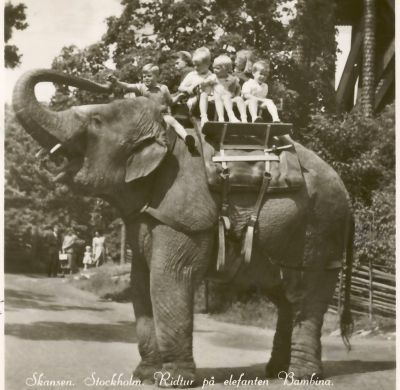 Between Stockholm and Capetown, Los Angeles and Tokyo, every city had their loved tame elephants, and every second child had once taken a ride on them, getting a lifelong fascination. This was a time without workshops, conferences, courses, zookeeper schools and "elephant trainers", this was a time when there was no tranqulizors or crush-cages to replace a keeper with a good hand with his animals. A time when most people had personal experience from work with animals, and many trainers and keepers had a background from farms and horse stables, as well as the visitors in the zoos. It was also a time when any people knew themselves the difference betweeen a firm training with dangerous animals, and animal cruelty. And animal cruelty as label were not yet a way for organisations to get attention, earn money, gain political power and give young people a possibilty to revolt against the society using welfare arguments. Common people would be able to identify animal cruelty without books or press releeases, or sensational reports. Truth, honor and moral was still existing. During those years, the lable "trainer" was seldom used, each and every elephant keeper knew how to put their elephants to work, and enjoyed rewarding with food and titbits by the end of the day. Accidents were in those days, in reltion to all elephants, and all hours worked with them every day, much more seldom. often, the situation could almost be like the relationship between captive asian elephants and mahouts, were man and elephant "bond", and develop a deep relationship, where mutual trust and confidence is a major part. Many worked alone throughout their lifes, with old-fashioned, stump hooks, no hotshots, and no written protocols, and still with less risks than today, because an experiened keeper managed to keep a balance in what he asked, and no people from outside critized, questioned, or prohibited the methods the keeper chose to reach this situation. There were, during those years, not yet any "experts", people who read books and knew better, even if they never worked one hour with an elephant in their whole life. The keeper learned actually from the elephants, in a trail-and-error way what was working and what was not. Not everyone could get education, suddenly there was a small elephant in the stable, and they just had to learn the job. But often they tried to get knowledge from elsewehere. In a few cases elephants went aggressive upto a point when they were not possible to control. They were killed, but alternative methods, especially for bulls started to develop, where some work were done through bars, so the elephant could not hit the keeper. This was a method that had been used now and then in Asia before, and it was an application from the stage when the elephants were trained in the Kraal. The majority of elephants, though, adapted very well to the captive situation in Zoos, and the training was not their problem, the health problems were more on arthritis, food related, or fights between the elephants, accidents and falling down in moats. Especially foot problems caused a lot of suffering, especially in Off-hand situations. The 1980�s saw new concepts of care and manegement. Dan Koehl washing Mala with high-injection power machine. Circus Krone, Germany 2000.Photo: Jutta Kirchner, Vienna Zoo. Since 100 years, the chief trainers at Hagenbecks Zoo in Hamburg, Germany has trained keepers from other places. The training is mainly based on a mixture of old Asian methods, and circus training. 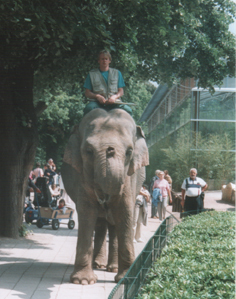 The Hagenbecks elephant house was for a long time considered a "Mecca" for elephant keepers in Europe, and the chief trainers are the legends in the profession. Also working a while with Circus Knie in Switzerland was considered fruitful. Standard of management, training and general care for elephants at Knie, has always been high, compared to other circuses or zoos, and they have had the best trainers. So, Hagenbeck and Knie, and the chief trainers there, has meant a lot to European elephant training traditions. Their, and their elephants names, live long after they died, and their deeds and whereabouts are still spread among zoo staff in Europe. Famous names are Joseph Haak, Fritz Thaisinger, Hugo Schmitt, Karl Kock and Ruedi Tanner, naming a few. Their knowledge and experience has spread almost like a genealogical tree, and their followers has formed a network for younger keepers, so that today, present tutors, were trained by one of them, or their pupils. But they did not belong to a tribe or cast, like in India, they were alone in their Zoo with their knowledge and experience, not to compare with other Zookeepers. During the seventies, animal welfare groups started to work commercial and political, often critisizing Zoos and circuses with true arguments, but later also with false. Their campaigns had an impact on the public, and when the wind started to change, keepers and trainers were slowly looked upon as primitive, brutal men, hurting the elephants just for fun. 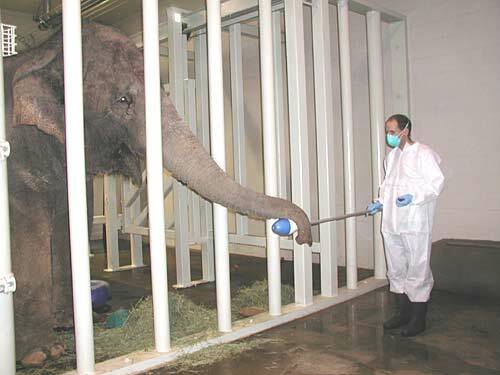 This was seldom the case, most professionals would make the health of their elephants as priority, but noone would back the professional elephant keepers up, they did not belong to a group. Also Zoos did not officially formed unions against the welfare groups, each Zoo tackled welfare critisim on its own. Already in the seventies, keepers started to work dangerous bulls through bars, trying to make them present feet for hooftrimming and such, without entring the stable. In many cses it went well, and this was tried out as a mesurmnt with highly agressive individuals, that would kill a keeper if they would enter the stable. The term protected contact started to be used. But it was regarded as a compromize, a second hand alternativ to manage elephants, when there was no other otion. Doplhin trainer started consulting Zoos, introducing training conept applied to water living mammals. 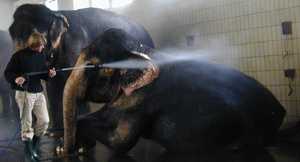 During the 1990�s the critics from animal welfare groups, as well as safety issues in Zoos has started a development towards protected contact training, and It was generally accepted at the EAZA elephant TAG meeting in 2004 that the best management method for the elephants and the keepers is the Protected Contact method, and that the fall-back recommendation of the EAZA Elephant TAG is protected contact. This change is not only positive. Protected Contact provides a limited alternative way of performing some medical treatment of elephants that can not be cared for in free contact, due to agressivness, (bulls) but can never replace free contact. The use of PC should therefore be a choice of the Zoos professionals, and not because of pressure from welfare groups. The last years, however, some Zoos choose PC as an entire concept, even if they keep elephants that could be cared for in free contact, and that free contact is working well in 90% of the cases. By this messure, the Zoo hope to reduce critic and safety issues. To reach a sufficient level of PC manegement, A Zoo needs about double the manpower as with free contact, since every elephant needs some isolated training every day, why this becomes a very expensive solution, or poorly trained PC elephants. And the trainer can not interfer with social problems, like fights and mobbing. The elephants are, in fact, unprotected in protected contact. And they will be restricted to move within the limited space of the stable and enclosure. Taming and hands-on training of animals may one day be history. The magical bond between the giant beast and the clever man will only exist on photos, or be seen in Asia. The elephants will never be taken out in a park for walks, but their enclosures and stables will look like christmas trees, desperately filled with whatever toy or mechanics available, that may be called behavioural enrichment. And the elephants will fight over those toys, and no keeper will go inside and tell them to interupt their fight. Visitors can not follow the interesting interaction bewteen elephant and keeper. The elephant keeper, or trainer, or whatever lable he or she wants to use for the profession, will be a zookeeper again, regardless how many whistles, targets or operational tools, they are using, whoever that follow a written protocol can be the person who manipulates the animal to perform a requested behavior. Theres no need for a relation bewteen man and animal anymore. There will be no more elephant trainer, no ridings, no shows, no walks in the park, or swimming in the river. Also no caress, no discipline, no leadership, no support, no dominance, no direct footcare, no brutality and no love. Only tools and distant operators. Its like music in the past and today. In the past music was when people played instruments and sang together. Today music is what happends when you press on a remote control.